Western blot analysis of extracts from 293T cells, mock transfected (-) or transfected with construct expressing full-length human Myc-tagged XCR1 (hXCR1-Myc; +), using XCR1 (D2F8T) Rabbit mAb (upper), Myc-Tag (71D10) Rabbit mAb #2278 (middle), and β-Actin (D6A8) Rabbit mAb #8457 (lower). 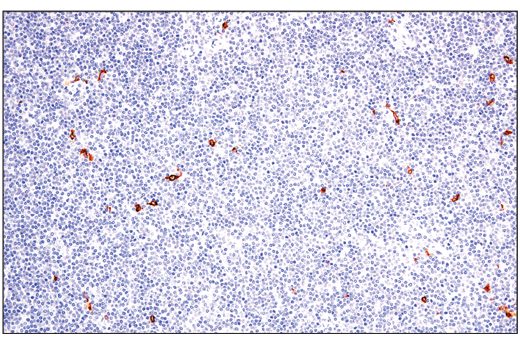 Immunohistochemical analysis of paraffin-embedded human non-Hodgkin's Lymphoma using XCR1 (D2F8T) Rabbit mAb performed on the Leica® BOND™ Rx. Multiplex immunohistochemical analysis of paraffin-embedded human tonsil using XCR1 (D2F8T) rabbit mAb (red) and CD11c (D3V1E) XP® rabbit mAb #45581 (yellow). Note expression of XCR1 on CD11c positive dendritic cells. 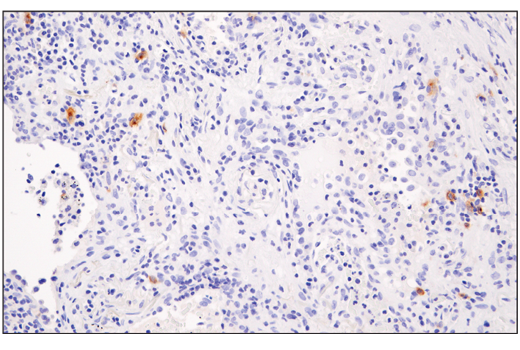 Immunohistochemical analysis of paraffin-embedded human squamous cell lung carcinoma using XCR1 (D2F8T) Rabbit mAb. 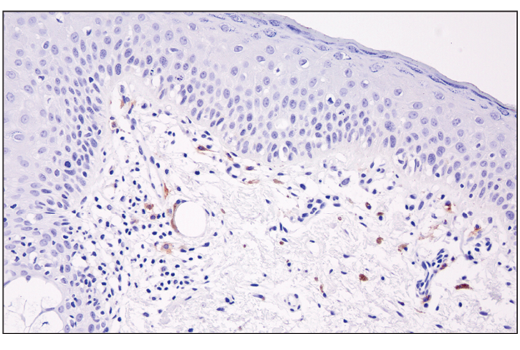 Immunohistochemical analysis of paraffin-embedded human skin using XCR1 (D2F8T) Rabbit mAb. 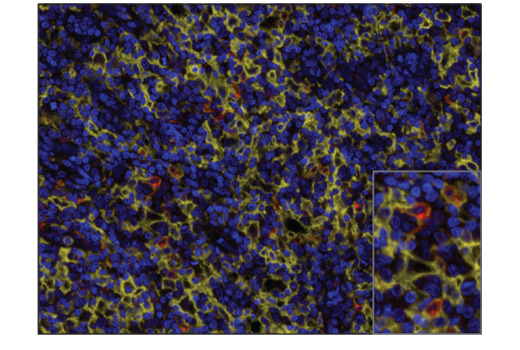 Immunohistochemical analysis of paraffin-embedded human lymph node using XCR1 (D2F8T) Rabbit mAb. 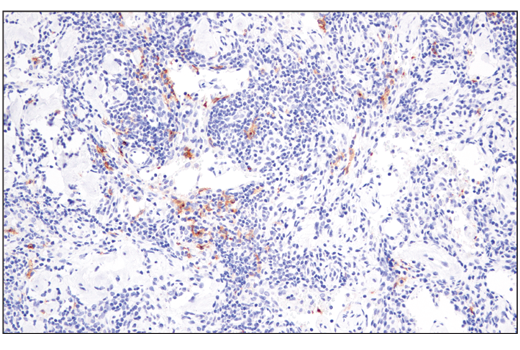 Immunohistochemical analysis of paraffin-embedded human tonsil using XCR1 (D2F8T) Rabbit mAb (left) compared to concentration matched Rabbit (DA1E) mAb IgG XP® Isotype Control #3900 (right). 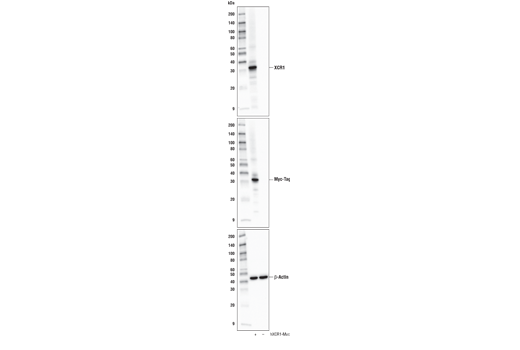 5 Primary Antibody^ Dilute in #8112 SignalStain® Antibody Diluent 60 min. 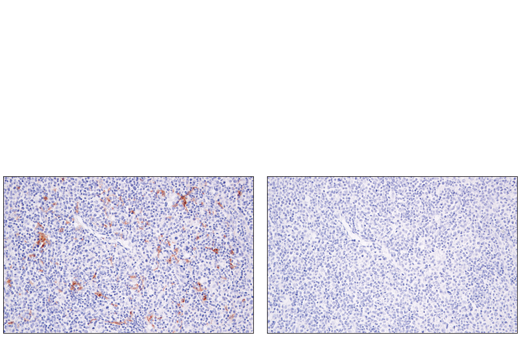 XCR1 (D2F8T) Rabbit mAb recognizes endogenous levels of total XCR1 protein by IHC-P and transfected levels of XCR1 protein by Western. Staining of unknown specificity in peripheral nerves has been observed. Monoclonal antibody is produced by immunizing animals with a synthetic peptide corresponding to residues near the carboxy terminus of human XCR1 protein. X-C motif chemokine receptor 1 (XCR1, GPR5, CCXCR1), part of the G protein-coupled superfamily, is expressed by a subset of dendritic cells and acts as a receptor for chemokines XCL1 and XCL2 (1-2,4). XCR1-positive dendritic cells cross-present antigens to naïve CD8+ T cells, priming them to become activated cytotoxic CD8+ T cells (3-5). In mouse models, the XCL1-XCR1 signaling axis was shown to be involved in the formation of self-tolerance through the development of Treg cells within the thymus (6). Yoshida, T. et al. (1998) J Biol Chem 273, 16551-4. Fox, J.C. et al. (2015) Cytokine 71, 302-11. Dorner, B.G. et al. (2009) Immunity 31, 823-33. Kroczek, R.A. and Henn, V. (2012) Front Immunol 3, 14. Lei, Y. et al. (2011) J Exp Med 208, 383-94.